The Mandarin immersion Program of the Fremont Unified School District has adopted the following instruction model and curriculum. Instruction starts with the 90/10 model, which is 90% in Mandarin and 10% in English for Kindergarten. 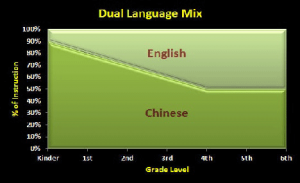 After Kindergarten, Mandarin instruction decreases 10% and English increases 10% each year until they are evenly split in 4th to 6th grades. Instruction follows standard state-mandated guidelines. The only difference between English-taught and Chinese immersion classes is the language of instruction. Classes have a primary teacher that only speaks Mandarin to them in class and therefore all subjects taught by this teacher are in Chinese. The students move to other classrooms and teachers for Science, Physical Education, and English Language Arts starting in 1st grade. Those subjects are taught in English. Azevada Elementary School has other English-only classes at all grade levels. The Mandarin Immersion program students share the same playground, cafeteria, school-wide assemblies, morning announcements, and library with English-only students and typically converse with those students in English. The curriculum for Kindergarten to sixth grade classes is based on the Better Immersion textbook series, which is based on the Common Core standards used by all of our schools. Students are taught using simplified Chinese characters. Pinyin, a phonetic system used in marking the sound of each Chinese character, is introduced starting in the second grade. At the junior high level, students are taught two periods in Mandarin and the other periods (English Language Arts, Math, Science, P.E.) are taught in English with the rest of the students at Hopkins. The subjects covered in the two Mandarin periods are History and Mandarin Language Arts. An elective course in English can be taken if the student opts to take P.E. as a zero period before the normal start of the school day.